It wasn't a great weekend for the blog, eh? Nothing posted all weekend, so I'll have lots of catching up to do here in the newsletter, so you'll have to bear with me. We finished up the second Waiver Draft on Saturday, which was one of the causes of a lack of work for the news updates and there were a number of other activities on the go, but the Waiver Draft is key. With the slim pickings for the Draft, there were a lot of passes in the second round. It will likely be a little while on Monday before the Draft is fully updated with the Waiver Draft picks, but it should be updated for all the final stats for the end of the night. More back-to-back weeks of high scoring goodness, as Dale B. claims another top week in the pool with 38 points. Since the first Waiver Draft of the season, Dale has moved up from 15th to 4th place, thanks to his top players getting healthy and a couple decent Waiver Draft picks. He's really making this into a season to remember, isn't he? This is Dale's third M&S nod of the year, which was also his third of the 8-week segment, which means good things for him in the prize department. His 38-point effort was the smallest effort to get him the M&S nod this season, but if its good enough, that's what counts in the end, right? Having big weeks for Dale's team in Week Sixteen were Henrik Sedin (5 points), Jonas Hiller (5), Phil Kessel (4), Slava Kozlov (4) and Evgeni Nabokov (4). It seemed to be a bit more of scoring by committee this past week, not having a really big week from any one player. Two of his active defensemen were held off the scoresheet, but that was about all that you could find as a problem for his team in the week. In the second Waiver Draft of the season, Dale decided against making any moves, so he'll be looking to stay healthy through the last ten weeks of the year in order to catch Leon, who he sits 38 points behind of. In the last eight weeks, Dale did make up 27 points on Leon, so with ten to go and a healthy team, it's certainly not out of the question. That brings me to the conclusion of the second jersey race and yes, it was Dale B. that captured the prize in the end. Dale finished off the segment with 276 points, 19 points clear of Benson in the race and 23 better than Wayne. It makes it difficult to catch a good team when they continue to put up M&S weeks. 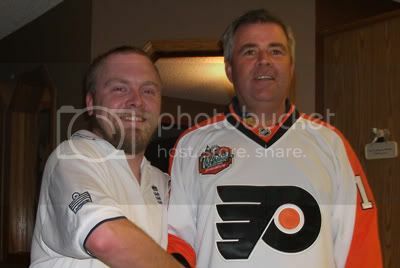 As you can see, Dale decided to take the Flyers Winter Classic jersey, instead of the stylish Bruins Winter Classic jersey, but growing up as a Habs fan, Dale didn't want anything to do with the Bruins, so the Flyers was his. Saying that, it means that the Bruins jersey will be up for grabs for the final segment of the season, which starts early today. With the second Waiver Draft picks in hand, there should be some more competitiveness in this next stretch, so good luck to everyone! Two teams in dire need of their Draft picks to kick in are John P. and Stacey, who both finished in the Basement of Week Sixteen, tallying 18 points to their names. For John, this is back-to-back weeks in the Basement, but in Week Sixteen, he doubled his weekly output in Week Fifteen, as if he can really take solace in that fact. Stacey, on the other hand, this is his second Basement Dweller nod of the season, his first coming a month ago. There isn't too much to be said about either team. Neither had much for consistent scoring across the board, lots of zeros on their team sheets. Between the two teams, Alex Burrows was the best player and he had 4 points in the week. Stacey currently sits 14th in the standings, while John cemented his position in 17th and there seems like there is going to be very little movement at the bottom of the table for the rest of the season. Just when I thought we were going to have a brand new name in the Player of the Week column, I get blindsided by a double-digit effort by one of our old favourites in the pool, Alexander Ovechkin. Ovechkin finished the week with 10 points, 3 goals and 7 assists. I know, its hard to believe that Ovechkin didn't have more than 3 goals in a week where he got 10 points, but its true, believe it or not. This massive week for Ovechkin lifts him into 3rd spot in the pool rankings, behind Martin Brodeur and Henrik Sedin and he's quickly closing in on both. Ovechkin's big week was highlighted on Friday night, where he had a 5-point effort at home to the Leafs. There he had a goal and 4 assists to lead the way in a 6-1 win. The Capitals finished 3-1-0 in the big week. On the Sheet in Week Sixteen, the gap between the leader John P. and the rest of the chasing pack lessened again, as all the teams are reeling in our leader. At the end of Week Sixteen, the lead for John now sits at only 44 points, as Paul W. and Wes M. each made some pretty good ground up. With only ten weeks remaining in the season, we should be in for a dandy of a race down the stretch here. I know I'm definitely looking forward to it. Having the best week in the pool for Week Sixteen was Wes, who took another 91 points to the bank. That's a season-best for Wes this season and his 2nd 90+ week of the season, which has kept him firmly in 3rd place in the standings. Wes also has only one trade left to make in the pool, so a glutton of injuries could sink his team, but it's been pretty stable so far. There wasn't a great deal of shuffling in the pool this week, as three teams moved up the most and that was only up three spots. Dale C., Scot J. and Trevor B. all moved up in the standings this week. Neither of which moved up into any of the money positions, but it was solid gains all around anyways. Tim L. did move into the money this week, as he ended a 2-week hiatus out of the money and jumped from 7th spot into 5th with an 85-point week to his name. That knocked Scott G. out of the money for the time being, as he was one of a few teams that dropped three spots in the standings. Don't forget to utilize those trades! They are really useful in a season like this. A leg injury has forced Todd White to miss a couple of games over the weekend for the Thrashers. The Box 19 forward missed both games on Friday and Saturday with the injury and will be a game-time decision on Monday. White was not a popular player on the Sheet as he probably shouldn't be. A slumping Dennis Wideman was made a healthy scratch on Saturday night for the Bruins. Wideman didn't last long on the bench, as he was put back into the line-up on Monday afternoon against the Senators. Wideman was likely just given a kick in the pants with the scratch on the weekend. We'll see how that plays out for him. For the Flames, they scratched David Moss on Sunday night against the Ducks, due to an undisclosed injury. Moss is expected to miss Monday night's game against the Sharks as well, but is still considered day-to-day for the time being. Moss is both in the Draft and on the Sheet this season, so this is somewhat of a significant injury. The Avalanche received some bad news, as Milan Hejduk will now be out of the line-up for upwards of a month with a knee injury. Hejduk has missed some time throughout the season with a wonky knee and now it looks like the team will allow him to take some time off and get his knee healed. For Benson, this is not what he was after now that he's in the mix for the money. The Dallas Stars had some injury concerns arise this weekend, as both Brendan Morrow and Jere Lehtinen left Saturday's game with upper-body injuries. Morrow suffered his injury while blocking a shot, returning for a shift, but leaving for good after that in the second period. Lehtinen is considered questionable for tonight's game against the Wild, but there is no indication what kind of upper-body injury it is. The Devils should be without Patrik Elias for a little while as the veteran forward was rocked on Saturday night by Colorado's Ryan Wilson in an open-ice hit. Elias was stretchered off the ice, but the initial reports from the Devils organization is that Elias is doing well and didn't suffer any major injury. No word of a concussion was mentioned, so he may just be day-to-day for the time being. The Rangers have put Ales Kotalik in the doghouse, as the forward was scratched from the line-up in both games over the weekend. There is no word as to whether or not Kotalik will return to the line-up right away this week, but as a healthy scratch, there will be a lot of tough love given to Kotalik down the stretch, likely making him a very poor fantasy player. A goaltending crisis had befallen the Penguins, as Marc-Andre Fleury suffered a broken finger against the Oilers late last week and was not able to go against the Canucks on Saturday night. With Brent Johnson already out of the line-up, the Penguins had to use an AHL call-up in John Curry and WHL tryout, Alex Pechurski. The Penguins will likely be without Fleury for a little while, but there wasn't any indication as to how long exactly. The Blues are close to the return of Box 9 forward, D.J. King, as he has been sent to Peoria of the AHL for a conditioning stint. King has been out with a broken hand since the beginning of December. King will likely not need the entire two weeks allotted for a conditioning stint, so he should be back in St. Louis soon. We're counting down to Hockey Day in Canada, as we still have one more normal Hockey Night in Canada to get through beforehand and it should be a pretty good weekend worth of action on Saturday night. In the early game, the Rangers are in Montreal to take on the Habs. Both teams are in the thick of the playoff battle in the Eastern Conference, so there should be plenty of passion in this game. Waiver Draft pick-ups Marc-Andre Bergeron and Brandon Dubinsky will make their Saturday debuts in the Draft. In the late game, the Blackhawks will visit Vancouver to take on the Canucks in a big measurement game for both teams in the early part of the second half of the season. The West-leading Hawks will have their hands full with the Canucks, who are battling for the Northwest title. Mason Raymond will definitely make his Saturday debut in the Draft, while its undecided at this point whether or not Antti Niemi will make his. Why Did Green Miss Thursday's Game?